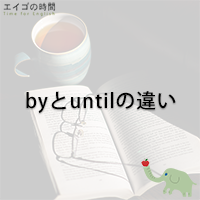 Home > ティータイム > byとuntilの違い – by or until? We’ll be at the office by 8:00. We’ll be at the office until 8:00. I need to submit this report by the end of the week. He won’t come until tomorrow.